Do you find yourself often separated from your children? Whether it’s due to job demands, divorce, military service or some other challenge, this is a growing issue for today’s fathers … including some of us at fathers.com. For all of you guys who love your kids and can’t be there as much as you would like, you can be “away but not apart.” Here are 3 thoughts to help you stay connected at home. Many of you have other tried-and-true strategies that work. Please share your ideas at our Facebook page. 1. Have a heart-to-heart talk with your family members. Is your absence weakening your relationships? You might be ignoring some warning signs or losing touch with your wife and children more than you realize. Sometimes it’s good to ask your child, “Am I gone too much?” Ask your wife, too. That feedback also helps you to keep your priorities straight when you are together. Your time and attention becomes more focused. Also, dad, be open to the possibility that changes may be necessary. If your family relationships are suffering or even dangerously at-risk, it’s worth checking into a different position at your company or even changing jobs. That might seem like an extreme option, but it’s much easier than a divorce, if you’re married, or seeing your children go through major struggles without you (or because of your absence). 2. 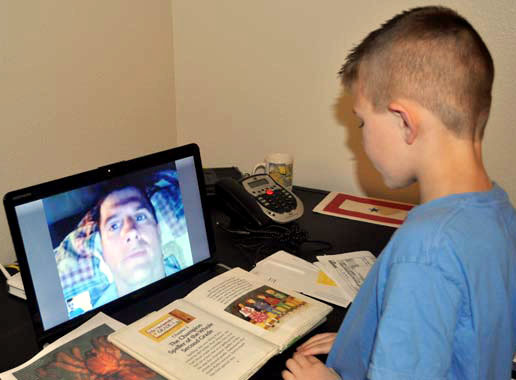 Find ways to stay in touch while you’re apart. Invest some extra effort and expense, whether that means texting, video conferencing, or your preferred way of staying in touch. Set up regular times for phone calls, so everyone can be available and expect your call. Be creative and find new ways to connect. 3. Conduct yourself with integrity. This might seem totally separate from your role as a father or a husband, but it’s all connected. Doing what’s right when you’re away from your children makes you a better man, which makes you a better father. Your self-discipline and character will make a difference in you life in many ways, and will spill over to your kids. Even when you aren’t with your children or you have legal challenges with their mom, do the right thing and keep your poise. You will bless your kids by maintaining a high reputation and a virtuous life. Many of you have other tried-and-true strategies that work. Please share some of yours below or at our Facebook page. If at all possible, shorten your work trip. Can you squeeze in a late meeting and then fly home late instead of waiting another day? Before a business trip, be sensitive to your wife’s feelings and find ways to lighten her load in some way. Also, do a few special one-on-one things with each of your kids. Build up a reservoir of time so your absence isn’t quite as difficult. Tell your children about why you’re leaving — what you hope to accomplish and the bigger-picture benefits it will bring to clients, consumers, or families. Leave your family members small gifts or notes of encouragement that they’ll find when you’re gone.